Slimming World Diary: Pushing It In The Gym .. I've just got back from the gym, my arms are quite tied but I'll try and get through typing this! Me and Gareth did an hour work out tonight, mainly cardio with 10 mins of weights at the end. We both want 2lbs, I want it to get in my new number and to get a new award. I think I pushed harder at the gym tonight. Anyone who knows me, knows I am not a runner, but tonight I ran for a collective 6 minutes. I know it doesn't sound like much but it was for me. An achievement almost. Before that it was 10 minutes to warm up, then after 15 cycling. I also like to get some rowing in there as well, I can always feel it on my arms. Then the weights to try and built some muscle since I have no strength at all. I got through it and now I feel much better for it. Before going to do any sort of exercise I have this internal groan and question if I really have to, but as soon as I'm working out the rush of adrenaline gets to me and I feel amazing afterwards! Before I went out I made dinner. This is what I would call a nice stomach warmer; Rich Banger and Bean Casserole. This is the first try for me and I can definitely say I will be having it again and not because there is leftovers in the freezer. ha ha. No its really nice and just completely warms you up. Easy to make, all in one pot. As you can tell by now I love my one pot recipes, so easy but so flavourful! 2. Spay a large casserole dish with Fry Light and place over a medium heat. Stir-fry the sausages for 4-5 mins or until golden brown all over. 3. Add the shallots, garlic, sage and pumpkin and fry for 3-4 mins. 4. Increase heat to high and add the white wine vinegar, tomatoes, beans and stock and season to taste. 5. Bring the mixture to the boil then transfer the casserole dish to the oven and cook for 1 hour, or until the sausages are cooked through and the pumpkin is tender. 6. Serve sprinkled with the flat-leaf parsley. 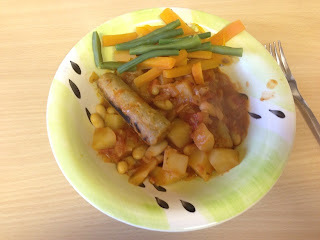 Great meal, really easy and only 2 syns per serving (serves 4). I just boiled up some carrots and green beans that I had left over to put some more superfree in there. Also I didn't have pumpkin so I substituted it with potatoes and it worked just as good. You could also have low fat pork sausages instead of quorn, just remember to syn them correctly.